And there, dear reader, we must end. Foodie heartbreaking though it is, we can’t cover all the wonders of Adelaide’s local produce-based restaurant scene here – if we tried, you would never find time to actually go out and eat, and we can’t have that, can we? For many more delectable decision challenges, visit the Eat Local SA website to find more Adelaide restaurants. Bon appetite. It’s just a few minutes’ walk from the V8 track/Garden of Unearthly Delights/Adelaide Festival’s North Terrace cultural precinct to the tranquil Botanic Gardens, and a pretty little conservatory-style building housing the Botanic Gardens Restaurant. It’s rather handy to have an enormous professionally curated garden in your back (and front) yard. The full kitchen team here roam across the entire gardens every day to harvest new treats, collecting their fresh vegies, leaves, herbs, seasonings, fruits and much more from this living larder. The Botanic Garden Restaurant promises ‘a regional restaurant in the heart of the city’, and there’s much about their approach to the produce that you’d also expect to see in a classy country retreat with a strong sustainability ethos. The Garden’s current crop of cumquats are being candied, a bounty of capers harvested a few metres from the kitchen door is being pickled, and the buttermilk left over from the day’s butter production is being transformed into a dressing with some seriously fresh tarragon. A 70 year old fig tree by the North Terrace gate has kept the restaurant supplied with delicate fruit in prime condition for weeks now, as has the Economic Garden, which has been producing eight different varieties of tomato since early summer. To the plate, I hear you cry! 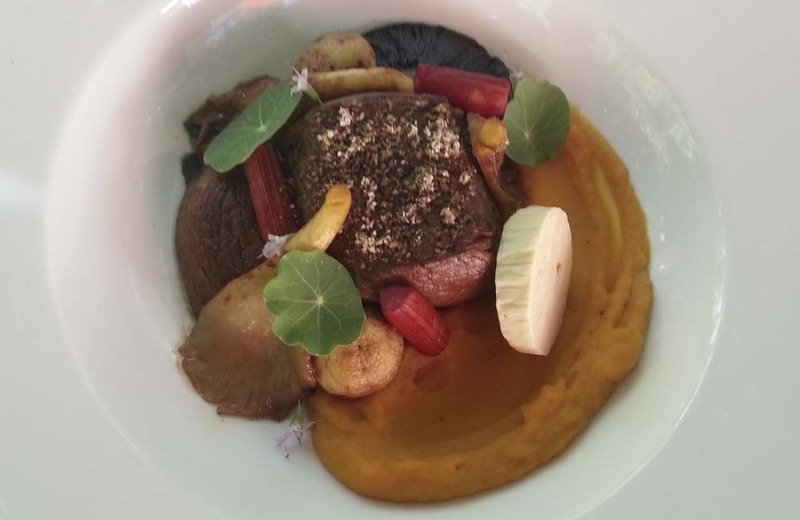 Consider this: Coffee-crusted Hahndorf venison served with a confit of purple Congo potatoes, pastrami, Agrodolce Radicchio and nasturtium leaves. The potatoes, greens and baby nasturtium leaves are all Botanic Garden-grown. The chicken galantine is a Greenslade chook, stuffed with pistachios and tarragon, and served with a fennel and cumquat gel, puffed quinoa and pickled shitake mushrooms. Tiny fresh garlic and onion flowers garnish a licorice-braised Angas flank steak with salad burnet. The flowers, the salad burnet, and the licorice? You guessed it, they’re all grown right here in the Botanic Gardens. In the bustling east end, just metres from Fringe central, Restaurant Orana’s eat local mission is a little different from most others. Yes, it’s about the premier South Australian produce, but it’s also about stepping back to work with ingredients that were here before European settlement began to influence food production. Restaurant Orana want to forever change our perceptions of indigenous foods, transforming them from being a potentially weird ‘bucket list’ experience to kitchen must haves. It’s working too, if the packs of fresh karkalla (pigface) now available in the Adelaide Central Markets is any indication. Orana’s menu is inspired by the indigenous ingredients coming into the kitchen each day. Orana’s ‘alkoopina’ starters (meaning delicious in the language of the Dieri peoples, whose country is in the top south east corner of South Australia) is an education in flavour, offering a range of new tastes in morsels such as Gulf St Vincent tommy ruff and carob Kangaroo Island marron, sweet clover and vinegar mother maclura fruit, riberry and tea tree. Riberries may also pop up in a concoction with aromatic julungin tea and frozen gin. The late Adelaide Hills season for riberries and muntries also known as native cranberries, from Tumbeela Native Bush Foods near Verdun, has been a boon this year so enjoy them while you have the chance. Coorong mulloway may be teamed with native cherries and sea parsley for lunch, or dinner might offer you Black Face Suffolk Lamb served with green beans, kohlrabi, quandongs and kutjera (a member of the bush tomato family). This is a restaurant where placing yourself in the hands of the chef is the way to go. Sit back and concentrate on experiencing each fresh twist provided by ingredients you may never have heard of, teamed with South Australia’s prime meat sourced from Richard Gunner’s Fine Meats, and fresh fish and seafoods from the waters of Kangaroo Island and the Coorong. A few streets away, is a restaurant that deserves its place as one of our city’s most beloved dining traditions. Nestled in the quiet sophistication of dark timber, crisp white linen and glittering glassware at Chianti, it feels as though you are with friends. And you are. Celebrating 30 years in the business this year means the Chianti team know exactly how to make you feel better about life. There’s a personal feel to the relationships supplying this kitchen too, probably because when natural restaurateurs connect with dedicated producers, they create partnerships made to last. Chianti is a restaurant with deep commitment to local and seasonal. Patlin Gardens are on hand with supplies of seasonal greens, olives, chillies and olive oil. Rich Jersey cream, from Grenoch in the Barossa Valley stars on a dessert menu that, in season, also featured Riverland stone fruits, citrus from Fat Goose Organics and Mt Compass strawberries. Durdin Farm, located in the Riverland, supply the ducks, currently matched with Helen and Lina’s Riverland peaches for the Insalata d’Anatra. Watch out too for new season pistachios from the legendary Food Forest, one of South Australia’s oldest certified organic producers, and seasonal cloudy Kalangadoo Organics apple juice. What better way to enjoy the cooling clear weather than with a dish of Cavatelli con Sugo di Capretto, with goat from Fleurida Goat in Inman Valley gently, patiently braised in a ragu style, and served with artisan pasta (made by husband and wife team Bigio and Antonietta in Tranmere). Or for something lighter, Chianti’s version of that quintessentially Italian favourite, Insalate Caprese, is made with award-winning Woodside Cheese Wrights’ buffalo curd, Patlin Gardens’ soil-grown tomatoes and extra virgin olive oil. And the perfect autumnal sweet treat just has to be a coffee-poached pear picked at Paracombe in the Adelaide Hills, served with chocolate mousse and chocolate sorbet. Half an hour’s drive from town will take you to Topiary Café, at Newman’s Nursery. Dining at Topiary feels both elegant and casual at the same time. The gardens of the nursery surround you with peace and birdsong, while to the table come all manner of pretty plates to share (or keep to yourself, if you are that way inclined). Here’s Topiary Café’s recipe for eating local: they grow or make everything in house. The end. Well, ok, the pumpkin and zucchini are from the famed market gardens of nearby Newton, the kale and squash from Kenton Valley, and a couple of weeks ago 20kg of plums came in from the chef’s grandma’s place. But a lot of vegetables and fruit are grown on site, or foraged from the surrounding areas, including rhubarb, tomatoes, herbs and a list of leaves and garnishes. From all this, and their own kitchen garden, comes a staggering list of house-made goodies. Biscotti, duck ham, butter, bacon, feta, haloumi, mascarpone, pickled oyster mushrooms… the list goes on and on. Topiary’s team are constantly adding to their larder in new and exciting ways. Autumn has arrived at Topiary in the shape of a new menu, including tender Meningie beef eye fillet served with SA mushrooms – pickled and roasted – smoked pumpkin puree, sous vide rhubarb (from the kitchen garden at the top of the nursery’s hillside property), fresh leaves (some from the bottom of the nursery’s hillside) and house-made anchovy butter. And who knew you could eat those silky tresses of the Newton-grown sweetcorn? These guys, that’s who. Dehydrated, the gossamer strands add the sweetcorniest of sweetcorn flavour to a surprising combination of corn served four ways alongside buttermilk pannacotta. High Tea here is justly famous, but Topiary Café goes casual wine bar-ish in the evening and, when they do, it pays to put yourself in their hands. For a taste of everything this kitchen turns out, the Night Parade Tasting Platter is the way to go. It could include anything from hay and honey smoked duck ham, served with pomegranate and house feta, to lentil and walnut pate served with cider jelly, prune paste and garlic crisps, or confit of pork belly with house-made quince aioli and pickled apple. Roll with it, and be happy. A panorama to di(n)e for! It’s almost a rule that any city worthy of the name has a restaurant known for spectacular views as well as great food. In Adelaide, it’s Windy Point Restaurant. And there’s a very Adelaide-style bonus too: you don’t need a 4WD to get here. It’s just 15 minutes up the road from the centre of town. By day, the panorama stretching from St Vincent’s Gulf to the surrounding Adelaide Hills gives you a bird’s eye view of Colonel Light’s visionary city design. By night, it’s a twinkling carpet of lights. And day or night, the food here reflects the restaurant’s commitment to the producers of South Australia. Region and season are on display across the a la carte and vegetarian menus. Yes, you read that right, there is an entire separate and delectable menu for vegetarians on offer here, including some out-of-the-box main course options inspired by cuisines ranging from Egypt to Italy. The combination of Adelaide Hills Suffolk Lamb seared rump and braised shank served on beetroot jam with red wine figs, almonds and parsnip, amply demonstrates the Windy Point love affair with so-called secondary cuts, just the thing for when the searing Adelaide heat gives way to mellow autumnal warmth. Or we could cut to the chase (otherwise known as the dessert menu) for honey toasted Willabrand Figs partnered with vanilla crème fraiche, brandy snaps, rose hip syrup and vanilla bean ice cream. The chef kindly provides us with a glossary as part of the specials menu, so we too can discourse knowledgeably about Smoky Bay oysters (from that glorious spot on the west coast of the Eyre Peninsula renowned for its seafood) and Hindmarsh Valley Demi Sel (cultured lightly salted local butter from Hindmarsh Valley Dairy). This attention to detail is evident everywhere, including in the option of organic gluten free toast, made with bread from Eve’s Organics in Glenelg, served with Patlin Gardens olive hummus and Hindmarsh Valley butter.